Ali sang a version of "Arirang," used in both Koreas as an unofficial anthem for peace. 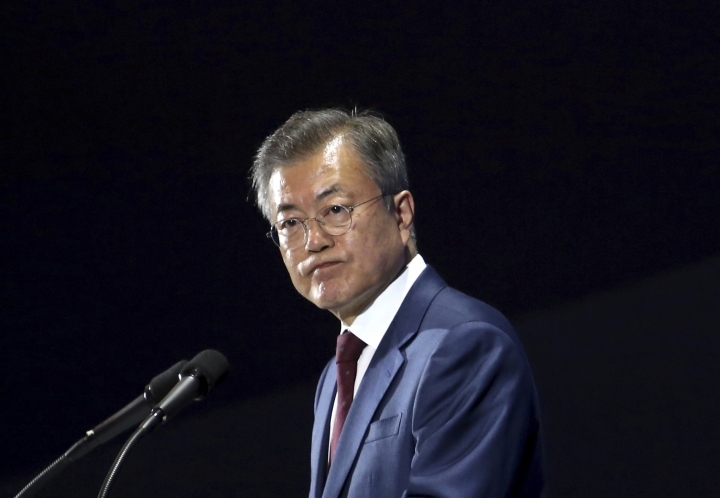 South Korean President Moon Jae-in says North Korea's agreement to allow international experts to observe a "permanent" dismantling of a missile engine test site and launch pad equals a commitment to "verifiably and irreversibly" demolish those facilities. Moon's comments on Thursday came a day after he and North Korean leader Kim Jong Un announced a joint statement in which the North also expressed willingness for a "permanent" dismantling of its main nuclear facility in Nyongbyon if the United States takes corresponding measures. 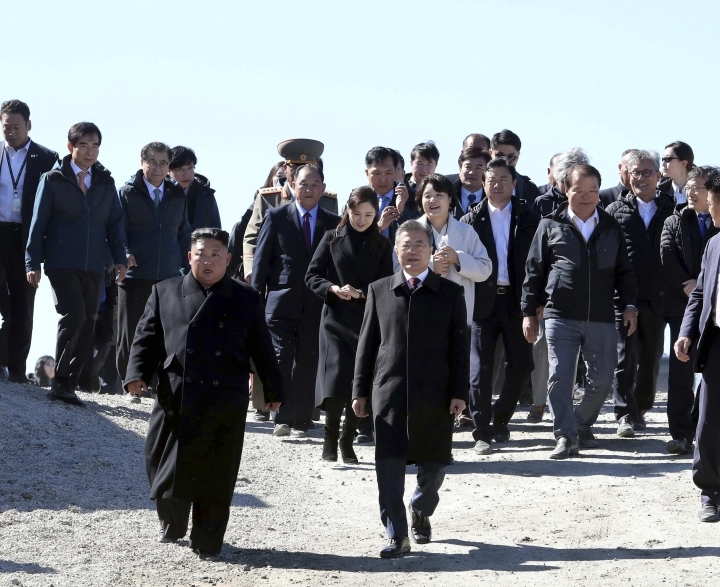 Moon says such steps combined with North Korea's unilateral but unverified dismantling of a nuclear testing ground earlier this year would prevent the North from advancing its weaponry through further nuclear and missile tests. Experts say the destruction of the missile engine test site and launch pad wouldn't represent a material step in denuclearization of North Korea, which declared its nuclear force as complete last year and has designed its most powerful missiles to be fired from vehicles. South Korea's president says he will discuss with President Donald Trump next week the issue of a declaration ending the 1950-53 Korean War. Moon and Kim are pushing for the end-of-war declaration by December. 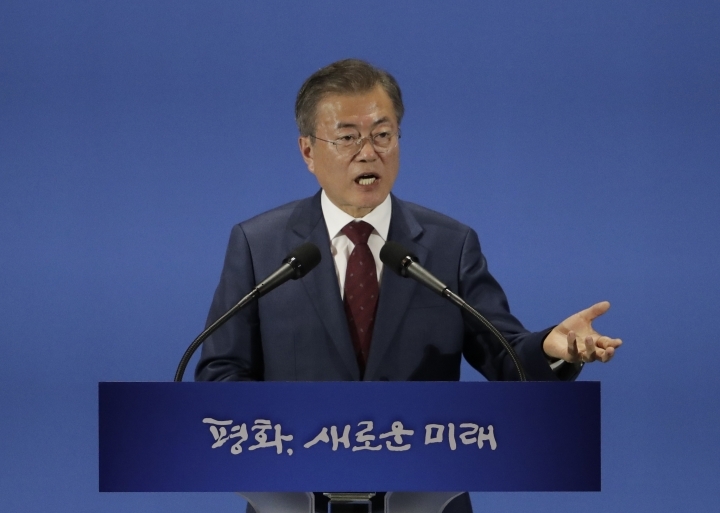 Moon says he and Kim have agreed such a "political declaration" has nothing to do with any pullout of 28,500 U.S. soldiers stationed in South Korea. Moon also says he'll convey to Trump his and Kim's desire to get a declaration ending the Korean War by the end of this year. The 1950-53 war still technically continues because it ended with a cease-fire not a peace treaty. 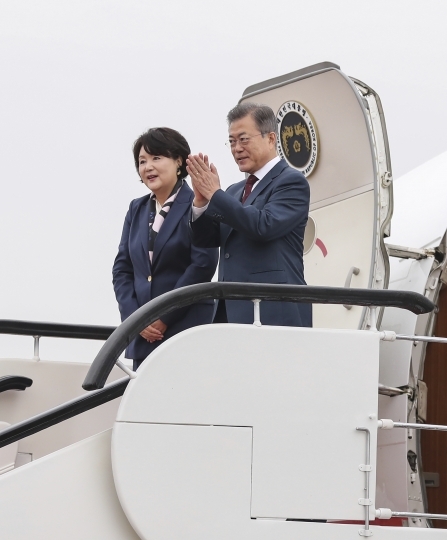 South Korea's president has returned home following a trip to North Korea for his third summit with North Korean leader Kim Jong Un. 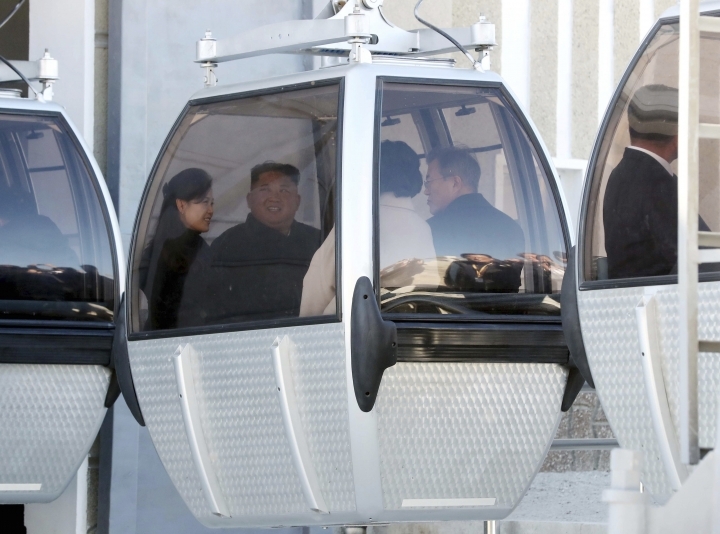 In Pyongyang, Moon and Kim struck a set of agreements that included some North Korean disarmament steps that experts say won't satisfy U.S. demands. 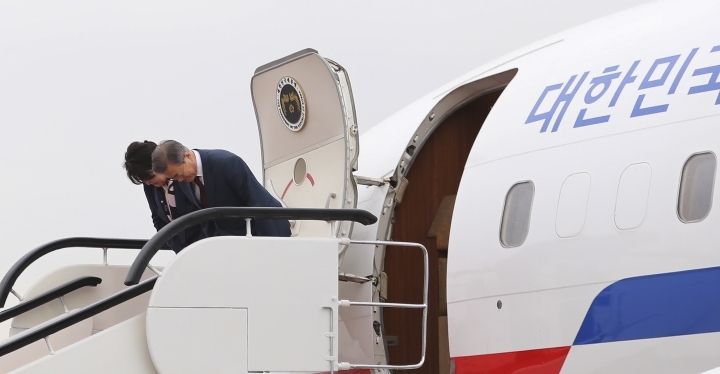 Moon's office said the president's plane left Thursday after the two leaders visited the sacred Mount Paektu on the North Korean-Chinese border. It's unclear whether Moon will speak to reporters after his arriving in South Korea on Thursday. 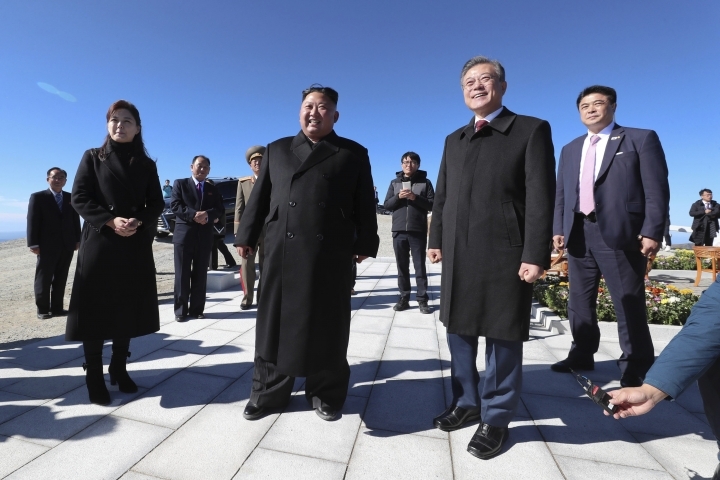 North Korean leader Kim Jong Un and South Korean President Moon Jae-in have visited a crater lake atop a volcano considered sacred in North Korea on the last day of Moon's visit for summit talks on the nuclear standoff and other inter-Korean affairs. 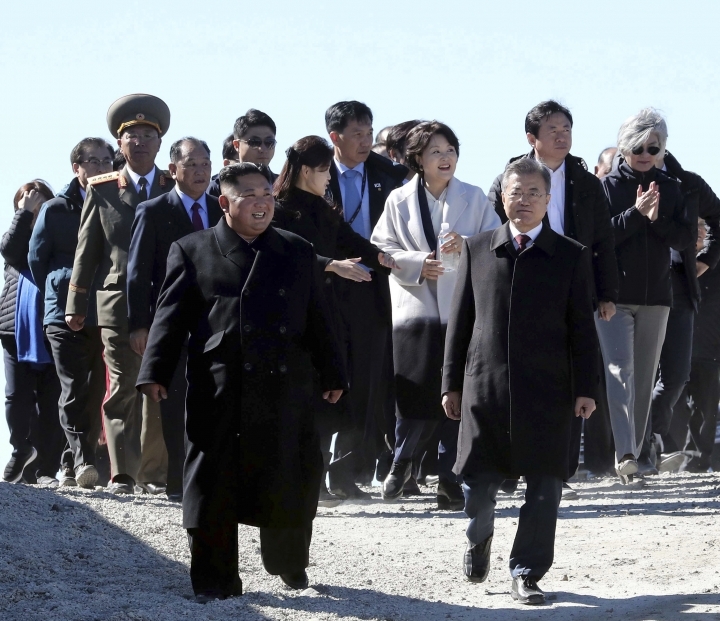 Moon says relations between the rivals should improve so that more South Koreans can visit the volcano. 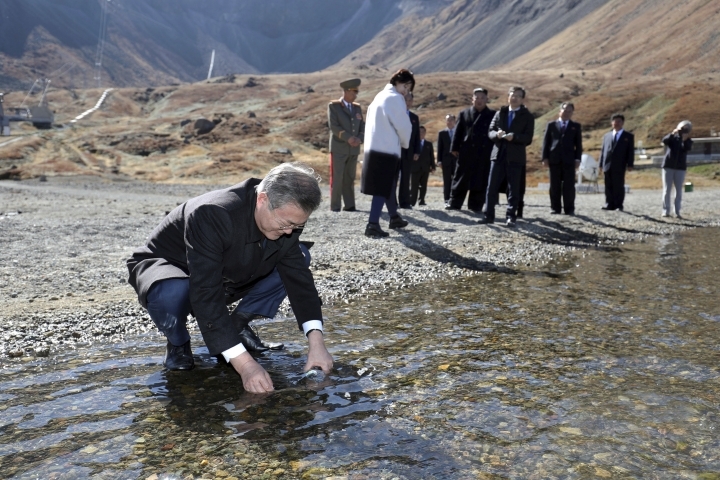 Kim say Mount Paektu has become a "subject of yearning" for South Koreans and Koreans living abroad. A stone marker commemorating South Korean President Moon Jae-in's visit to Pyongyang has the wrong dates carved on it. The carving saying "Commemorating Visit to Pyongyang. Sept. 18-21. South Korean President Moon Jae-in" temporarily confused journalists who wondered if Moon's visit had been extended a day. Moon plans to return to South Korea on Thursday, or Sept. 20. Moon's office says North Korean workers made a mistake. 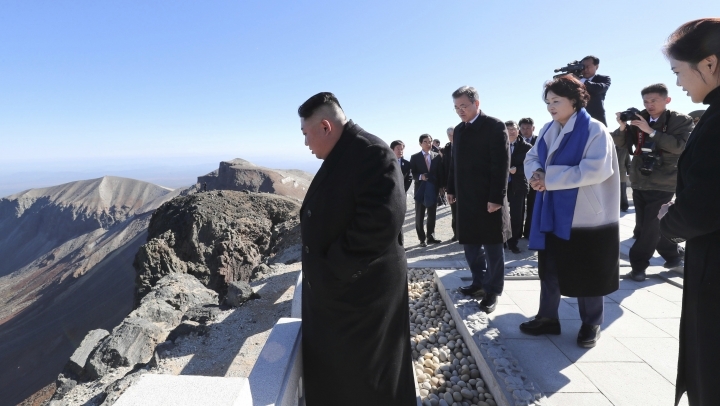 North Korean leader Kim Jong Un and South Korean President Moon Jae-in are visiting a volcano the North considers sacred on the last day of Moon's visit. The volcano topped with a deep crater lake is at the heart of North Korea's foundation mythology and used to legitimize the Kim family's dynastic rule. Members of the Kim family are referred to as sharing the "Paektu Bloodline." The mountain is also emblazoned on the national emblem and lends its name to everything from rockets to power stations. Moon, North Korean leader Kim Jong Un and their wives attended the performance of "The Glorious Country" at Pyongyang's May Day Stadium on Wednesday night where they observed thousands of performers working in precise unison. South Korea says the mass games drew about 150,000 spectators. Moon said in his speech: "We have lived together for 5,000 years and lived in separation for 70 years. I now propose that we completely eliminate the hostility of the past 70 years and take a big step forward in peace so that we can become one again." Historians say the 5,000-year timeline of Korean history is a groundless claim that became part of South Korea's official narrative after being inserted in school textbooks during the rule of former dictator Chun Doo-hwan.